Heat oven to 350°F. Line 24 muffin cups (2-1/2 inches in diameter) with cupcake liners. Stir together sugar, flour, cocoa, baking powder, baking soda and salt in large bowl. Add eggs, milk, oil and vanilla; beat on medium speed of mixer 2 minutes. Stir in boiling water (batter will be thin). Pour batter into prepared pans or fill cups about 2/3 full with batter. Bake 22 to 25 minutes or until wooden pick inserted in center comes out clean. Cool 10 minutes; remove from pans to wire racks. Cool completely. Frost with Chocolate Buttercream and decorate with sprinkles. 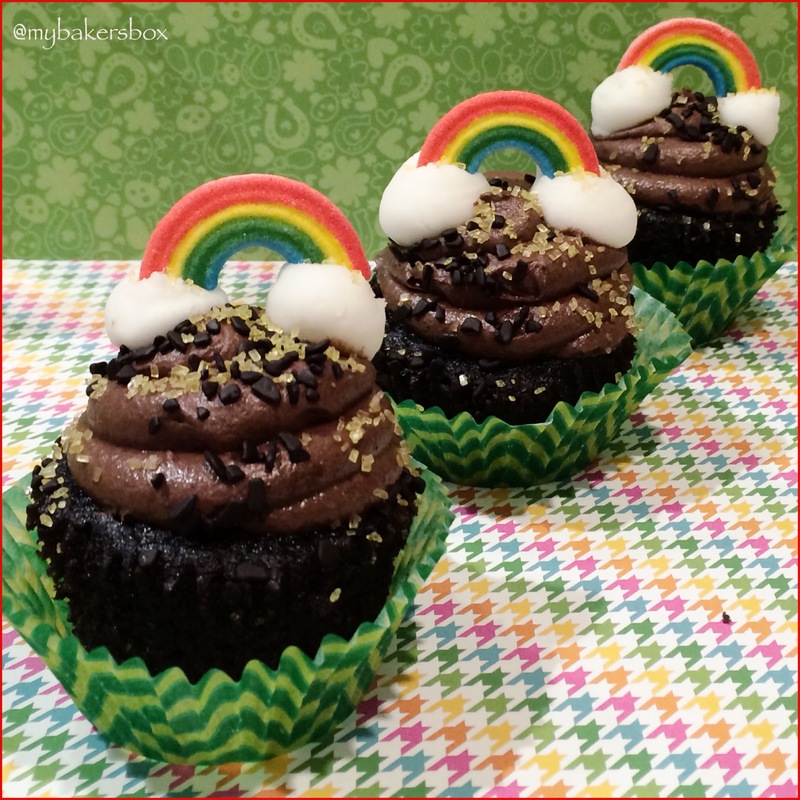 We piped a little bit of the store bought frosting in a cloud shape to attach the rainbow sugar. Makes approximately 24 cupcakes. Using the wire whisk attachment of your stand mixer, or an electric mixer, whip the butter on medium-high speed for 5 minutes, stopping to scrape the bowl once or twice. You can store any unused buttercream in the refrigerator in an airtight container; let it come to room temperature and then give it a quick whip in the mixer before using. March My Bakers Box- All about Brunch!